What are the key dates and times for this event? There is a limit of 1500 full marathon and 2500 half marathon participants. The half marathon usually sells out in January or February so register early! Is there a pre-race Expo? ...post-race Party? Yes, see https://tobaccoroadmarathon.com/pre-race-expo/ and https://tobaccoroadmarathon.com/post-race-party/. Is there a pre-race meal? Is there a finisher medal for both distances? *Price increase dates subject to change based on supply and demand. Is there a relay option? Can I have someone else pick up my race packet for me? Yes. They must have a photocopy or image/picture of your driver's license or another photo ID; a picture on a cell phone is sufficient. No. We don't provide refunds, but know that we send 100% of the proceeds to charity. However, you can change distances, transfer your race entry fee to a friend, or defer to next year...which offers you some of the greatest flexibilty in the running world. See below for how to do each of those. When does registration open for "next year?" Registration typically opens by April 1 with "Early Bird Pricing." In some years, registration for the next year is available starting at the Pre-Race Expo. Unlike some other races that limit your options, we at the Tobacco Road Marathon try to be as flexible as possible, allowing you to change your race distance, transfer your registration to someone else, or defer to next year. We charge a minimal fee for the extra processing required and establish limits/deadlines only to avoid extra costs. Roughly one month before the race, we necessarily limit these options once we start incurring costs based on registered runner counts. Note: We are not associated with any other race, so there is no deferring or transferring your registration to a different race. I deferred my 2018 entry; am I automatically signed up for 2019? No. You must register using the same email address used in your 2018 registration and register for 2019 by December 31, 2018. No exceptions. I signed up for 2019, but I cannot run. How do I defer my race entry to 2020? All deferrals must be submitted by February 17, 2019 (one month before the race). You will not be able to defer after this deadline for any reason, even if you have a doctor's note or other hardship. This is because all preparations (bibs, t-shirts, water, food, etc.) will have been made planning your participation. If you choose not to run the race the following year, you will lose your race credit. There is a $15 fee to defer your registration to the next year. The 2020 race date is planned for Sunday, March 15, 2020. Yes. You can change from the half to the full marathon for a $15 upgrade fee OR from the full marathon down to the half marathon for no charge. You can NOT switch from the Tobacco Road event to another race; this is the only race affiliated with our organization, and we can not send your registration fee to another company. Can I give or sell my race number to someone else? Yes. However, you must officially transfer your entry so the new runner can register and sign the waiver. (Running with someone else's bib could result in disqualification.) The originally-registered runner will not incur a fee to transfer, and the new runner will pay just $15 to register. These details will be emailed to the new runner once the original runner submits the request form. Parking Passes, subject to availability, transfer with the bib transfer. Transfers must be initiated by the registered runner. Please have a valid email address for the new runner. The new runner MUST register using the same address proided during the transfer within two weeks of the initiated transfer. The bib does NOT automatically go to them. THEY MUST COMPLETE THE TRANSFER by registering, providing their information, and paying the $15 transfer fee. How do I initate a transfer? All transfers must be completed online (transferred entry and the new runner registered) by February 17, 2019 (one month before the race). If we leave the transfer option poen after that date, the new registered runner is not guaranteed their desired t-shirt size. Note that there WILL NOT be any transfers done during packet pickup. We do not resell bibs for runners who are unable to run; we do not condone selling bibs on Craig's List or any other reselling forum. Anyone found reselling registrations or parking passes for profit will be asked to donate their proceeds to charity. What if I register for the full marathon but only run the half marathon? Per USATF rules, you will only receive a time if you run the event for which you are registered. If you are registered for the full but just run the half, you will be disqualified. You will not get a time; it will be marked as a DNF (did not finish). You will not receive a medal for either event. If you are registered for the full and do not feel like you can complete it, do NOT turn on to the half-marathon course at the 2.5 mile split. Instead, keep on the marathon course until you get back to the split at Morrisville Parkway and then return to the finish rather than proceeding south on the American Tobacco Trail. Doing this will give you about 17 total miles. If you do this or shortcut the course anywhere, please do NOT cross the finish line with the timing device on your bib. Doing so will distort the results, potentially impact awards and rankings for others, and create additional work. If you are reigstered for the half but run the full, you will have a very slow half time, but hopefully hours of fun! Please see https://tobaccoroadmarathon.com/directions/ for directions. The Embassy Suites, located at 201 Harrison Oaks Avenue, Cary, NC 27513, is very close to the airport--less than 10 minutes. To book a room for our race, please use this link (http://group.embassysuites.com/TobaccoRoadMarathon) to secure our group rate. The room block will sell out so book early. Please note that the hotel is about a 20 minute drive from the race site and also about a 20 minute drive to the remote parking (if you don't buy an on-site parking pass). Unfortunately, we do not provide transportation to/from the hotel. Limited parking is available at the start/finish area, but there are only 900 parking passes for on-site parking. These are sold for $10 during registration, but they typically sell out by November. The parking passes allow vehicles to park at Thomas Brooks Park (a.k.a. USA Baseball) beore the race starts. For the 2019 race, as of November 10, all parking passes have been sold. They are no longer available. If you don't buy a parking pass (or once they sell out), there is ample FREE parking at the remote NetApp lot with FREE shuttle service to and from the venue for runners and spectators. (Note: Pets are not permitted on the shuttles, nor will the shuttles accommodate wheelchairs.) The NetApp lot is 6 miles away (so we don't recommend walking/running from there), and the shuttle takes less than 15 minutes. The shuttles run continously from 4:00am to 2:30pm. Spectators may also buy a parking pass (subject to availability) on our registration page. Additionally, parking passes are not enforced after runners begin to leave the finish area. That means that parking spaces typically begin to become available after 10:00am, so if you want to see your 4+ hour marathoner finish, you should be able to park at the Thomas Brooks Park...unless all the half-marathoners are having too good of time at the post-race party! Maps to the race site and to the remote parking/free shuttles as well as additional parking information including spectator information will be available at the Expo, or see https://tobaccoroadmarathon.com/directions/. Is there transportation provided from the host hotel? No. We provide shuttle service ONLY from the remote parking area at NetApp in Research Triangle Park. Yes. The time limit for all races is seve (7) hours. Any runners on the course after 2:00pm will be picked up by one of the SAG wagons and brought to the post-race party. Please note that the last shuttle leaves USA Baseball at 2:30pm. Yes. While the American Association of Pediatrics (re: http://pediatrics.aappublications.org/content/pediatrics/86/5/799.full.pdf) does not preclude younger children from participating in endurance reports, we ask that half marathon runners be at least 12 years old on race day and marathon runners be at least 16 years old on race day. Given the nature of the trail course and limited road access, it can be hard for parents to monitor their child's progress. However, running can be a bonding experience, and many parents have run our courses with their teenage children. Will photographs of my race be avaliable? Photographers will be at the start/finish area and along the course for pictures. Keep your race bib in front and visible! Pictures will be available for purchase a few days after the race. Will bag check be available? Yes. Bag check is available near the post-race food area. Bring a small bag for your items. We are not responsible for lost items, items that fall out of bags, or items that are left at bag check after 2:30pm. We recommend using a bag with a zipper to prevent lost keys and phones. Tags to label your bag with your bib number will be provided. We will get wet; we do run in the rain, and we will have our big tent for pre and post race shelter. The safety of our runners and volunteers is our top priority. Dedicated race officials monitor the weather for any threatening issues. In the event dangerous conditions arise, such as lightning, we do have a course evacuation plan. Consistent with the USA Track & Field position on weather and weather-related cancellations, we do not offer refunds. Participating in an organized run is a "shared risk" event. That is standard practice in our sport and industry and also part of the waiver in forms all participants agree to when they register. What free merchandise to you provide runners? For 2019, we provide A4-brand tech t-shirts in unisex and women's sizes...blue or green depending on race distance. We are also giving away Altra-branded "fandanas" which can be used on to keep cold--or the sun--off your neck. Or pull it up over your mouth and nose to keep your face warm. it can also be used to keep the sweat out of your eyes, or use it as a headband to keep flyaways under control. Note: The last day to register and be guaranteed a race t-shirt is one month before the race. If you miss this deadline, you can check for leftover sizes at the bag check tent on race day. Typically we do have extra shirts available, but they may not be in your desired size. Will there be food on the course? Yes. For 2019, our Gu Gel flavors are going to be Salted Caramel and Strawberry Banana. We will also have Stroopwafel available in Salted Chocolate and Wild Berry. There may be other snacks at some of the marathon aid stations. DO NOT THROW GEL PACKS OR TABS ON THE TRAIL! There will be trash receptacles right after hand-out points, otherwise hold them to the next aid station. Plese leave it clean for other users of the trail. What is the official race drink? For 2019, we will have Diamond Springs water and Gatorade Orange Flavor. No. There are a couple rolling hills at start/finish but the American Tobacco Trail is all flat or gentle inclines/declines. The course was an old railroad track and trains don't like steep hills (neither do most runners). This means fast course times! Keep in mind our event is a favorite among those seeking to qualify for the Boston Marathon; we qualify nearly 20 percent of our marathon runners! Yes. The North Carolina Roadrunner's Club Pace Team will be providing the pacers for full and half marathon. Full marathon pace teams will match up to the Boston Qualifying times. Stop by the Pace Team booth at the pre-race expo to sign up and meet your pacers. May I wear my headphones? If you are going to wear headphones, we recommend wearing one ear-bud to hear what is going on around you. Failure to comply with volunteer, lead biker, and police instructions could result in disqualification. Will port-o-johns be available on the course? Yes. There will be nine aid-stations on the course (most of them are run by twice since this is an out-and-back course), and multiple port-o-johns will be at every aid station as well as near the start/finish line. No. USATF does not allow jogging strollers at a sanctioned race. In addition, because of the moderately narrow trail, the volume of runners, and the need to keep access for medical vehicles, we do not allow joggers or strollers on our course. Special consideration for groups pushing a disabled athlete may be requested by emailing the Race Director at info@tobaccoroadmarathon.com. What happens to our discarded clothing? All items left at the starting line and on the course (throw down shirts, gloves, jackets, hats, etc.) will be picked up and donated after the race. Please try to leave your clothing at the starting line or at the clothing drop located at mile 2 before you enter the trail. This makes it easier for our clean up volunteers to collect these items. Per USATF rules, gun time will be used for all awards overall, military, masters and any other division receiving monetary compensation for their winning. Age group awards are calculated by chip time. The top 3 men & women overall for the half and full marathon will be announced from the stage. Awards for the half marathon start about 2 hours after the race starts and the full marathon awards ceremony goes out about 4 hours after the race starts. Checks will be mailed out 24-48 hours after the race so we can verify all results. Age-group winners will be posted at the results tent near the stage and awards must be picked up on race day. You can pick up your award as results are finalized. If you cannot stay, please arrange for someone to pick it up for you. If you cannot stay to pickup your award and don't have someone who can claim it on your behalf, you can email Info@TobaccoRoadMarathon.com for instructions on how your award can be shipped to you for an additional fee. 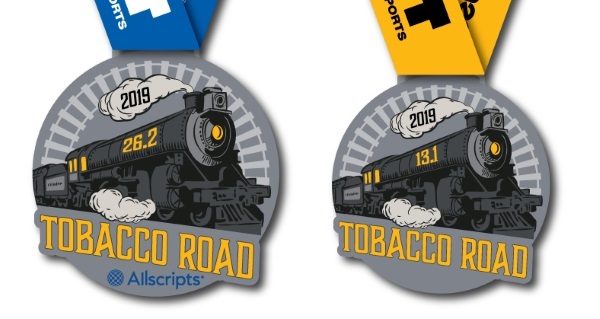 Is the Tobacco Road Marathon a Boston qualifier? Yes. The course is USATF certified and is eligible for use as a Boston Marathon qualifier. As many as 18% of our runners qualify for the Boston Marathon! All Tobacco Road runners who run a qualifying time can go to the results tent after the race for verification. Once your time is verified we will award you our coveted Boston Marathon Qualifier T-shirt!